Minds Eye Theatre is the LARP version of the various rules for White Wolf’s World of Darkness setting. As I have little knowledge about LARP and do not particularly like it, I will mostly voice my opinion on how useful this book is for traditional pen-and-paper games instead. I should mention that this book was a gift from Teylen, an avid World of Darkness fan and good friend. Otherwise, I have little connection to the WoD and rather play OSR games. Thus, I will not review the game in regard to WoD canon, but rather how well it stands on its own, and how it compares to the Vampire rules and the Gamma Slice I reviewed some time ago. Generally, not much changed compared to Vampire: the Masquerade. There are 800 pages with dense writing and a couple full page pictures of werewolves that are probably meant to symbolize the different tribes (at least the symbols align with the symbols shown in the tribe chapter). The layout is not fanciful, but mostly well done. I would welcome markings on the outer margins to quickly find the beginnings of chapters, generally reading the book is easy, but finding something is difficult. Also, in some cases the book refers to terms that are only explained later without linking to them. 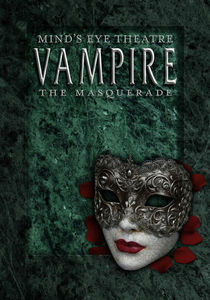 The short stories between the chapters are less coherent than the ones in Vampire. Where Vampire offers one character that leads you through the different steps of playing a Vampire, Werewolf constantly changes characters and mainly concentrates on beating stuff up. They do not help me at all in playing a werewolf, unless this is meant to be a tabletop skirmish game. Whereas Vampire played simply in a slightly more gothic version of our own world, the world of Werewolf is a dystopian post-apocalyptic version of our world. Just a couple years ago, the werwolves fought a host of invading Wyrm forces (the Wyrm is the main antagonist in Werwolf) to a standstill, hardly keeping any of their Caerns (sacred wolf’s den) intact. Recently, they defeated several of their enemies though and even managed to find a way to create new Caerns. If they manage to keep them intact for a couple years, the damage will be healed. Of course, the Wyrm sends his forces to destroy them, and several other supernatural creatures are keen on using them for their own purpose as well. The metaphysical background for the Werewolf worlds are three spirits: The Wyrm (destroyer), the Weaver (keeper), and Gaia (creator). Originally, all three of them kept each other in balance, but the Wyrm got caught in the Weaver’s net, and now everything is going down the drain because the balance shattered. Also, humanity used the chance to break free from the weaver, which somehow results in the world becoming more and more attuned to the weaver. That, again, prevents the werewolves from keeping humans developing technology (as Gaia commanded them), which in turn means that the werewolves cannot do their job anymore. Except for the Red Talons (one of the werewolf tribes), nobody seems to mind though, and I absolutely do not understand why. Werewolfs were created to keep humanity in check, but mostly ignore them (and occassionally defend them against the Wyrm). Some werewolves even manage to live and work in cities, even though that should (by the rules) drive any human in their vicinity insane within less than two hours. In Vampire, I had a reason why my character tried to remain humane (and how he did so), but there is no such reason for Werewolves whatsoever. This makes Werewolves a much more monstrous game than Vampire in my opinion: In vampire you mourn for your lost humanity, whereas in Werewolf you simply do what needs to be done, in this case commiting as much genocide as you can with your limited ressources. Even though the game is called Werewolf, there are plenty other Fera (animals that can change into human form) around. They mostly get along, and are mechanically similar to werewolves. The biggest exception are the were-spiders, which are working for the Weaver instead of Gaia. The organization of shaperchangers is much more convulated than that of Vampires. For Vampire, you decide for one of two sects and a clan. For Werewolves, you have the Garou nation (a confederacy of all werewolfs and some Fera), and a couple unaffiliated Fera. Within the Garou nation, there are two parties: The Confederacy of Stars (Progressive Shapechanger Party) and the Gaia Nation (Conservative Shapechanger Party). All tribes (and some Fera) belong to one of the two parties. Then you have tribes, a bunch of wolves who consider themselves related by blood and share certain characteristics. Within each tribe (and most Fera), you also find three camps (usually sages, rogues and fighters). On the last political level, werewolves belong to septs (villages) and packs. On a mythical level, they also have to choose an Auspice, which influences their abilities. Even though there seems to be way more options compared to Vampire (which only had clans and sects), I feel much more shoehorned in creating my character. The games uses many of those units, but they seem incoherent and convuluted. Werwolf brings a whole bunch of new rules along, but keeps the basis rules from Vampire with just a few cosmetic changes (supernatural beings are now allowed to use smartphones to call people and to send text messages, for example). You still play rock-paper-scissors to figure out who won, with skills acting as tie-breakers. The rather simply Humanity and Blood mechanic of Vampire has been increased to a combination of Gnosis, Rage, Seethe, Harano and Wyrm Taint. All of those are gained and lost differently, and used for different purposes. Where in Vampire you may fall to the Beast that lurks within, in Werewolf you can fall victim to the Curse, into Frenzy or into Despair. As additional social rules, there are Challenges, which regulate strife between werewolfs, and Moots, which solve political problems. This all on top of the system for Renown and Favours that were already introduced with Vampire. Now, the news rules are not necessarily bad. Often, they are used for excellent effect, for example the combination of totem, sept and auspices is just great. It is just the sheer amount of different stats that are overwhelming. After reading VtM, I had an idea how to play Vampire – after reading Werewolf, I was completely at a loss. After reading Vampire, I understood why the Vampires do what they do and why they are organized the way they are organized. With Werewolf, everything seems to be slightly out of touch, as if somehow artifically imprinted an external frame onto the setting. Vampire: the Masquerade could get away with medicore rules because of its immense flavour and evocative setting. With Werewolf, the setting seems just as mediocre as the rules. 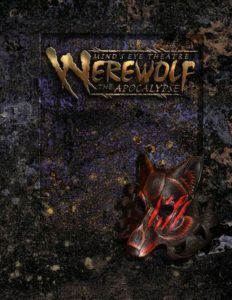 I do not like Werewolf: the Apocalypse, it lacks everything that I liked about Vampire. I can only imagine using Werewolf as an inspiration for a setting of my own, but could not imagine playing it as written. Dieser Beitrag wurde am 29. Oktober 2016 von belchion in Rollenspiel veröffentlicht. Schlagworte: Rezension, werwolf. The Cthonic Codex offers you to play in the Valley of Fire, where several great school of magicians compete with each other and send their apprentices on adventurous tasks. It was written for the 5MORE rules from the Adventure Fantasy Game, but brings also along compatibility information for OSR games. It was released by Lost Pages. As the name cthonic codex implies, the setting takes place underground, in a series of canyons and tunnels beneath the Valley of Fire. Central are the five great schools of magic vying for power, but the two lesser schools, remnants of the squid empire, dragons and some other groups are involved as well. As with Into the Odd, which is also distributed by Lost Pages, the layout is really horrible. Different fonts change seemingly without rhyme or reason, for example, within the monster manual all rules text is written in cursive to distinguish it from the monster’s in-world description – most likely because the different font meant to achieve this was not different enough. It does not help either that the “creature compendium” is listed as first book, even though it is difficult to understand without some setting information from “mysteries & mystagogues”, listed as the third book. Furthermore, illustrations are merely used to adorn the book instead of a tool. For example, the very nifty setting and map creation rules are a description of how to draw something, completely in text. 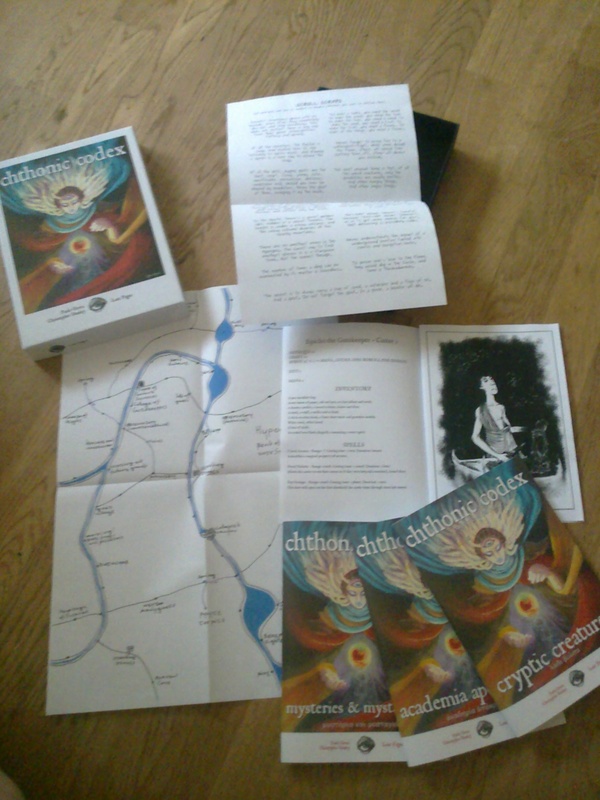 The box only contains the final result, but no sketches of how to get there – luckily, Harald already created illustrations for the different steps: Chthonic Codex: Chthonotron in action. Once one gets through this mess, the setting begins to shine though. The magic, be it spells, fetishes, idols or even cantrips, comes with a different air, powerful but with caveats. Laws of magic influence the world, with the cause always remaining completely arbitrary for the characters. All in all, the magic in this setting feels somehow magical without going completely bizarre (even though sometimes it skirts weirdness). Other than more traditional settings, you cannot use the Chthonic Codex out of the box. It requires some time and effort to familiarize yourself with the mindset and the rules, as it only highlights the important points and leaves it to the reader to draw the connections. That makes it very easy to customize the world to your needs (as Harald did in his Sylvan Realm), but of course also means you have to conjure your NPC from thin air. Basically, this setting offers you a good approach to magic, turns academical disputes, higher education and university politics into adventurous stuff, and countless of inspiration to be included into any setting. While I would probably not use it as my main setting (except perhaps for a mini campaign), I will definitely sprinkle content from the codex into my other games. Dieser Beitrag wurde am 18. 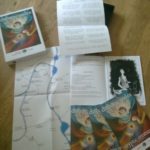 Juni 2016 von belchion in Rollenspiel veröffentlicht. 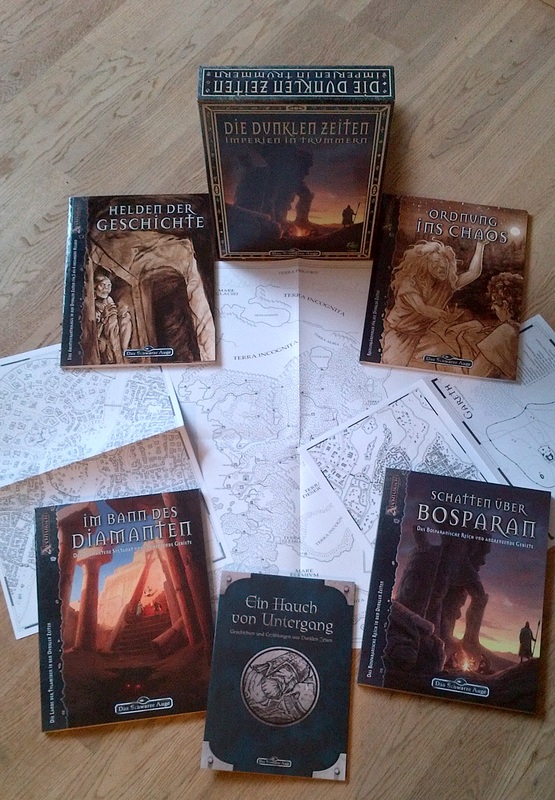 Schlagworte: osr, Rezension. Into the Odd belongs to the games inspired by the hexploration gameplay that was re-popularized by the OSR. It does not try to emulate older versions of D&D, as many other OSR inspired games do, but follows its own way alltogether. Within its 48 pages, the game offers a complete set of rules, an adventure, and a setting. The brevity demands a price though: The layout could do better. Page layout constantly changes depending on how much has to be squashed in, the illustrations are a hotchpotch of drawings, public domain pictures and photos. While this is not a problem when reading the book for the first time, it makes it difficult to find specific rules later. The rules themselves fare much better though: They are concise yet flexible. For my taste they are slightly to light for long-term play, as I prefer a little more detail, but I could fully imagine to use them for one-shots or even mini-campaigns. Compared to games like The Black Hack, with their beautifully designed single resolution mechanism, Into the Odd feels a little rustic. Nonetheless, usability was definitely a key impetus during game design. A great example for this is character creation: You randomly determine the value of your attributes, but the higher your values are, the worse your starting package (equipment, money, and other boons). During game, all actions are resolved by either attacks (if you try to harm someone with a weapon) or by saves (everything else). An attack always hits, damage depends on weapon, circumstances and armour. Thus, even a character with low attributes can contribute fully on the majority of all actions. For a save, you need to roll below an attribute with a d20. These rules work on all scales, from individuals to structures, and organizations. For magic and setting, Into the Odd follows the path of Lamentations of the Flame Princess, or the works from Zak Smith (Vornheim, Read & Pleasant Land, Maze of the Blue Medusa). As those, it attempts to make magic less mechanical and more occult without laying it completely into the referee’s hand, and adding a level of weirdness to the setting. Even though one only finds the most bare-bone description of the setting, it draws on so immensely powerful concepts and clichés that you immediately know what it is speaking about. Instead of your typical pseudo-medieval fantasy world, it implies a clearly industrialized setting with the urban metropolis of Bastion as its centre. Rural areas are dangerous and often abandoned, but home to ancient (and valuable) arcana. Bastion is already difficult to understand, but the farther you leave civilization behind, the less binding natural laws are – till they completely lose any meaning in the Far North, which is only implied in the book but described in further detail on the author’s blog. Despite its accessibility and its author’s ongoing work, it lacks from support though. It is to different from standard D&D to easily integrate existing adventures or other gaming materials, those can be only used as inspirations. Thus, it cannot draw on the plethora of materials the OSR offers. It is a great game in its own right, but it lacks the weight of several decades of RPG to fight its way to the top, and for this reason alone it will never become my most commonly used game. On the other hand, it is to similar to those games to be considered fully unique. Still, if you want to give your campaign a twist or are generally interested in nifty rules, you should at least check the Into the Odd blog out. I definitely do not regret that I bought it, and it will definitely be my first choice if I ever run a game in the universe of the Thief computer game series. Dieser Beitrag wurde am 13. Juni 2016 von belchion in Rollenspiel veröffentlicht. 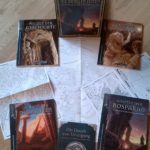 Schlagworte: osr, Rezension.